Ever since I began my MHA degree, I have analyzed the average medical cost severity for lost-time workers’ comp claims. 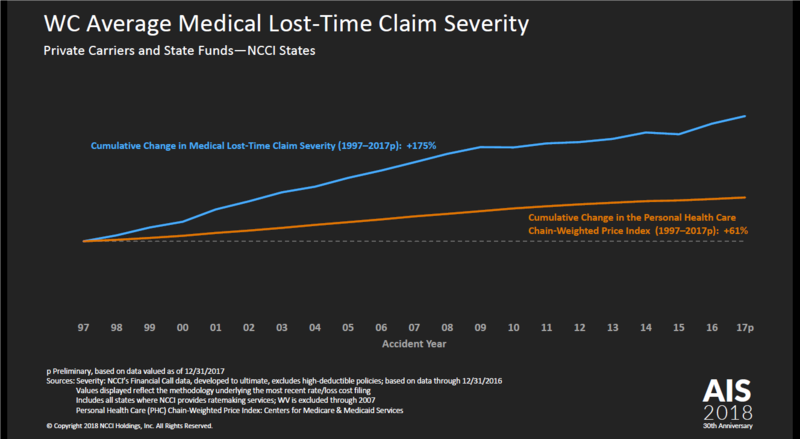 The average medical costs for lost-time claims have been rising steadily for the past two decades and only recently had a negative change. 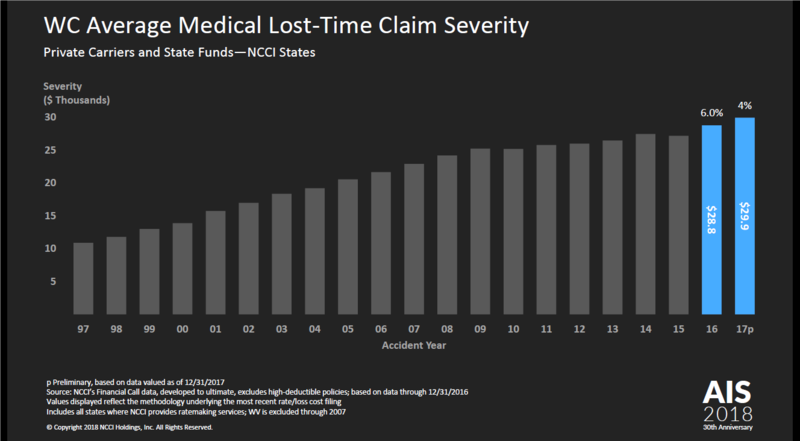 The data for average medical lost-time claims severity comes from all jurisdictions where NCCI provides ratemaking services. The data is valued as of 12/31/2005, and accident year 2016 is preliminary as of 12/31/2016. NCCI estimated that Accident Year 2016 was 5% higher than the corresponding 2015 value, as seen in Chart 2. Source: NCCI’s Financial Call Data p Preliminary based on data valued as of 12/31/2016. Comparing the above chart with last year’s chart, you will notice that there is a difference of 0.4% for 2015. 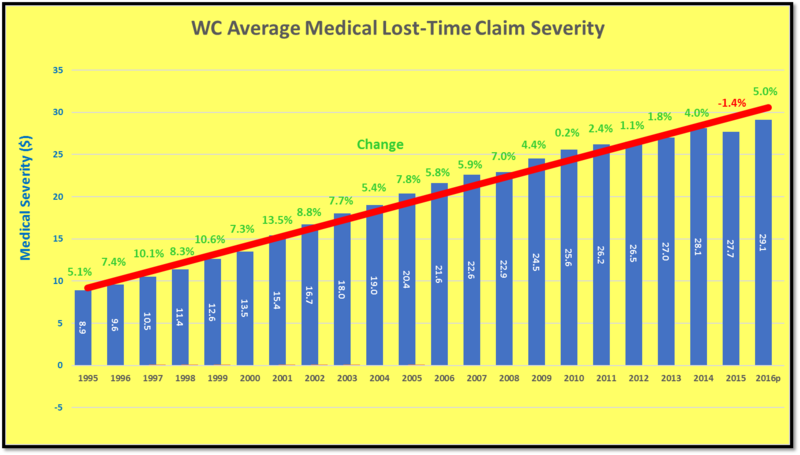 Looking at both charts, it is easy to see that the average medical cost for lost-time claims is still going up, and is now closer to $30,000. The trendline has been increasing since 1991. I have been advocating every year that doing the same things repeatedly, and expecting different results is not only crazy, it is not lowering the average medical cost for lost-time claims. It is also apparent that the enactment of the ACA has not done much to lower the average; in fact, just the opposite. 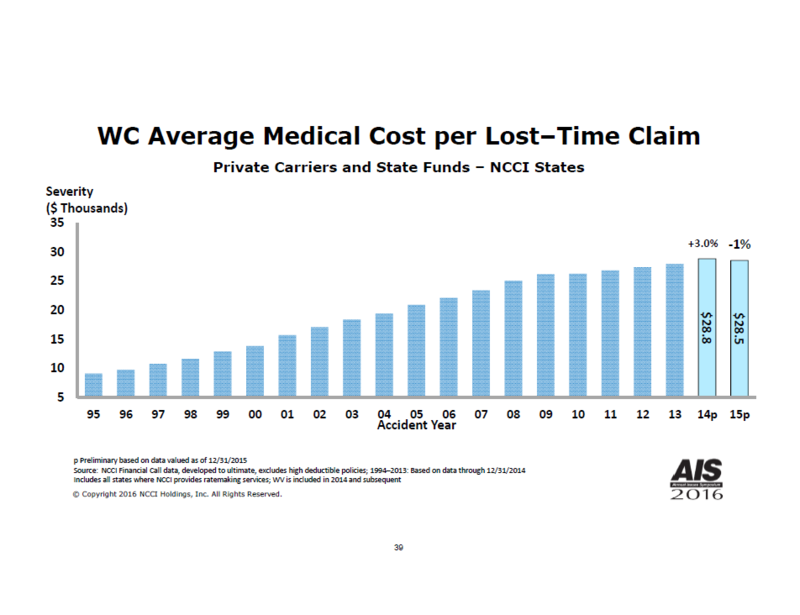 NCCI went further in analyzing average medical cost by examining the cumulative change in the Medical Lost-Time Claim Severity from 1995 – 2016, as indicated in Chart 3. Sources: NCCI’s Financial Call Data; Centers for Medicare & Medicaid Services p Preliminary based on data valued as of 12/31/2016. The growth in the corresponding Personal Health Care Chain-Weighted Price Index (PHC), a proxy for medical care price inflation that responds to changes in the blend of different medical services over time, varied from 2.6% in 1995 to 1.3% in 2016p. 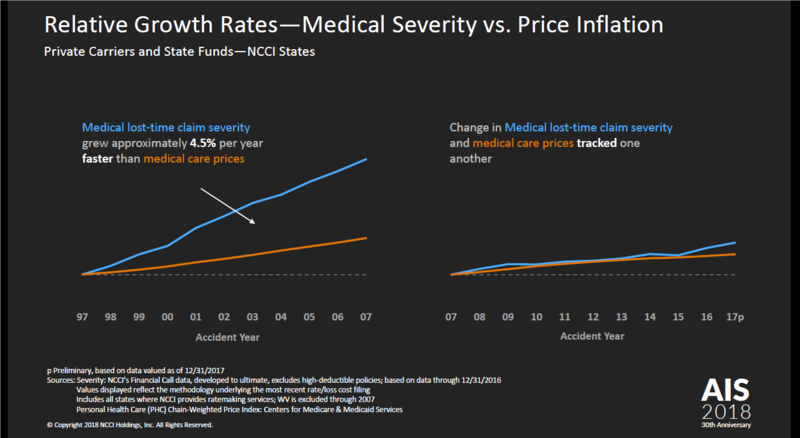 In the latest year, medical lost-time claim severity increased by 5%, compared with a 1.3% growth in the PHC. In 2015, medical lost-time claim severity decreased by 1.4%and the PHC presented its lowest increase in years (0.5%). When the changes in medical lost-time claim severity is compared to the change in the growth of the PHC index over three time periods, any change over and above the change in PHC is considered a change in the utilization of medical services. From 1995 to 2001, PHC increased by about 16% and utilization of medical services increased 56.6% for an overall combined increase in medial lost-time claim severity of 72%. In the most recent period, the change in utilization is almost nonexistent. The majority of the observed changes are increases, indicating that the average medical benefit level across most states was higher in 2015 than in 2011. Mississippi’s relative higher average medical severity change is primarily the result of larger losses. Virginia is in the process of developing a medical fee schedule, which may put downward pressure on that jurisdiction’s average medical lost-time claim severity. 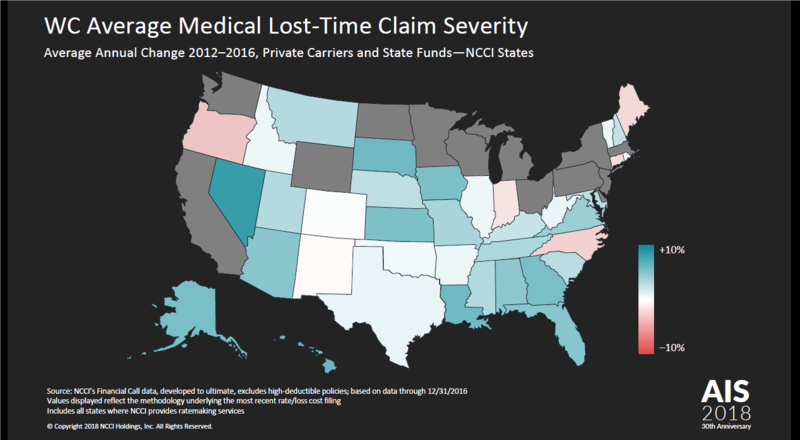 This is the eighth Annual State of the Line report I have examined, and from all the data I have seen in this period, the average medical cost for lost-time claims has never shown a marked decrease with all the various methods employed to lower costs so many in the industry have touted. And while there have been cases where costs have gone down for individual employers and states; overall, this is not the case. Perhaps it is due to medical cost inflation, or perhaps to the cost of health care generally, but either way it is not getting better. This entry was posted in Average Medical Lost-Time Claim Severity, Claims, CMS, NCCI, Workers' Comp, Workers' Compensation and tagged Costs, Lost-Time Claims, Medical Costs, Workers' Comp, Workers' Compensation on May 24, 2017 by Transforming Workers' Comp.